A commentary published last week in Nature argues for the regulation of sugar as a toxic substance. The authors and I agree about ends--reducing sugar intake--but have some potential differences about means. The notion that sugar is a "poison" was established when a lecture by Dr. Robert Lustig espousing that view went viral. Dr. Lustig has made the same case in peer-reviewed articles, and he and his co-authors do so again in last week's commentary. While the construction of alarming tables and figures demonstrating the calamitous effects of sugar (and specifically, fructose--Dr. Lustig's particular nemesis) can be defended with legitimate science, it is nonetheless something of a distortion. Even more calamitous pathways could be mapped out for oxygen, which in excess is not just highly toxic, but lethal in rather short order. Oxygen, per se, is not poison of course. The dose makes the poison. So, too, for sugar, including fructose. Our excessive consumption of it is the poison. There is no question that excess sugar is one of the great liabilities of the modern diet, and consequently, one of the great liabilities of public health. Excess sugar intake is implicated in everything from obesity to diabetes to coronary artery disease. Because excess consumption of sugar induces hormonal imbalances, notably high levels of insulin, which in turn foster inflammation, excess sugar intake is linked to cancer risk as well. 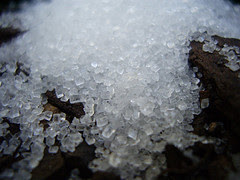 Finding effective ways to reduce ambient sugar intake is not only warranted, but rather urgent, as we confront epidemics of obesity, diabetes and associated chronic diseases. Dr. Lustig and colleagues argue for a modest tax on soda and for restricting sales of "fizzy" drinks and candies during school hours. I support these proposals. There is no reason why schools should be propagating the consumption of solid or liquid candy by students. As for the tax, arguments that it is an unfair burden are fatuous. People who really want soda can by and large afford the extra penny, and people who can't afford the extra penny should perhaps consider that they can't afford to squander such limited food funds on the empty calories of soda. Certainly if they can't afford an extra penny for soda, they can't afford to get and treat diabetes! If the tax nudged them to drink less soda and more water, it would be as intended. There is no inalienable right to afford soda in the Constitution. The authors also propose subsidies in federal programs, such as WIC and SNAP, for healthful foods. Here, too, we agree entirely. But they also suggest an age limit for purchasing soda. They propose regulation or a ban on television commercials for "products with added sugar." As stated, this would encompass virtually all breakfast cereals, many breads, all desserts, many salad dressings, ketchup, jam, pancakes, deli meats and much more. That may be what the authors intend. Whether it is or isn't, it hints at the challenges in determining just where nutrient-based regulations should begin and end. It also shows why the tempting comparison to tobacco (made by the authors) is of limited utility. Tobacco can be banned outright. Food and most ingredients in food cannot. And even the most healthful diets on the planet generally contain some foods with added sugar. The dose makes the poison. Regulating nutrients, per se, is a slippery slope. If we regulate sugar, we should certainly regulate trans fat, which is far less important to palatability, and more toxic in smaller quantities. But what about sodium, which the Center for Science in the Public Interest has argued kills 150,000 Americans a year? The Nature authors argue that fructose should not have GRAS (generally recognized as safe) status from the FDA; the same argument has been made about sodium. Do we regulate both? And if so, what about the real culprit in much of what most ails modern public health: calories? The root cause of most diabetes and much other chronic disease is obesity, and the most indelible link between weight and food is not composition, but quantity. If sugar is poison because of the harms of excess, so too--and then some!--for calories. Shall we regulate the quantity of food people eat? Even if we were to isolate sugar as public health enemy number one, its regulation would draw us into challenging subtleties. There is, of course, sugar (and fructose) in fruit, which Dr. Lustig and colleagues clearly do not mean to indict. But what about canned fruit packaged in fruit juice? Where, exactly, would the regulation start, and end? If we did succeed in making sugar in all forms the enemy, what is to prevent the food industry from making far more use of artificial sweeteners, and what do we know about the health effects of that? I have concerns that the bounds of sugar regulation are not clearly defined -- and would prove challenging, at best. I have greater concerns that excessive focus on any given nutrient, good or bad, invites the proverbial failure to see the forest for the trees. We have cut fat, and eaten poorly. We have cut carbs, and eaten poorly. We could now cut sugar, and still eat poorly. We have decades of dietary debacles to show we are unlikely to get to health one nutrient at a time. It is past time to start thinking about the overall nutritional quality of foods, and diet, which are what truly matter to health outcomes. Sugar is an important component of this, to be sure, but only a component. Just as a preferential focus on any given nutrient may divert attention from the overall nutritional quality of foods, a preferential focus on the food supply can divert attention from the potential power of the food demand. Ultimately, food manufacturers committed to their bottom lines care about one thing above all: keeping the customer satisfied. If we empower people with readily interpretable information about nutrition, they can act on it. We do not need randomized trials to prove that the food demand trumps the food supply; we have seen natural experiments prove it. When the Atkins diet was wildly popular, every supermarket in the country filled up with low-carb foods, no regulation required. The challenge is to convert this latent power into a force for genuine good, by directing it at the overall quality of nutrition rather than the next nutrient preoccupation du jour. Empowering the public to demand better nutrition and less sugar involves finding effective ways of telling people some things they never knew they never knew. For instance, you likely know that the first item on an ingredient list is the most abundant. So, if you are concerned about your sugar intake and want some apricot jam, which is better: the one with sugar as the first ingredient, or the one with apricot as the first ingredient? It's a trick question: they may be identical. What manufacturers do sometimes is "divide" the sugar added to a food into multiple aliases: sucrose, corn syrup, and so on. If no one of these is more abundant than apricot, they can list apricot as the first ingredient. But what really matters is that added up, sugar by all these different names is, in fact, the most abundant ingredient, just as it is in the competing jam that lists sugar first. Such practices undermine a consumer's ability to demand better, and that needs to be addressed. We eat too much sugar; doing so conspires against our health, and needs to change. The ends are clear, the best means are less so. I worry that some good intentions could bog us down in conflict that forestalls all progress, distort the relative importance of just one nutrient relative to overall nutrition, and land us on a slippery slope headed toward unintended consequences. The sweet spot will be defined by what works in the real world to improve the quality of prevailing diets, and health.